If you are vacationing on Maui, you'll want to experience Maui from the seat of a bicycle! You won't need to ship your bike to Maui to enjoy cycling on vacation! Instead, equip yourself with bicycle gear and performance bike rentals from West Maui Cycles. A rainbow from West Maui during a Maui cycling vacation. Road bike riders visiting Maui won't be disappointed by our Maui cyclery! Our performance road bicycle rentals are ready for the Maui cycling adventures. The Specialized Roubaix is our high performance road bike rental. Enjoy cycling the roads of Maui on the performance bike named after the famous annual cobblestone road race! Use our bike ride info with maps and bike routes for the most popular road bike rides on Maui. Our Maui bike blog features ride descriptions with bike maps for the The West Maui loop bike ride and other cycling routes on Maui including the ride to Haleakala and the Olowalu petroglyph bike ride. Mountain bike riders longing to experience the diverse mountain bike trails on Maui will find a huge selection of mountain bikes rentals and size options at our bike shop in Lahaina. From the Specialized Comp 29'er Hartail for trail and cross cycling to diehard trail riders requiring a full suspension Specialized FSR to bike down Haleakala, we've got 'em all! Our rental bikes are maintained by expert technicians and our shop is staffed with full time professional bike mechanics for bike repairs or service. If you shipped your mountain bike to Maui and need bike trail info, visit Maui mountain bike ride information with trail maps for biking the Haleakala Skyline trail, Poplipoli and Makawao Forest Reserve bike trails. For honeymooners in need of a little romantic bike adventure, we have the perfect tandem bike rental on Maui! 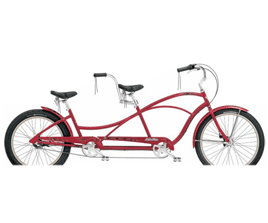 Ride the stylish red Electra Hellbetty tandem bike with your sweety as you explore the historical sites in Lahaina. If you are vacationing solo or just don't feel like sharing a tandem on Maui, you'll love our Electra beach cruiser bike rentals for men or women and you'll still arrive in style as you bike to one of the many West Maui restaurants! Hellbetty Electra tandem rental cruiser available at West Maui Cycles. Forget your bike shorts, riding gloves or other cycling gear before departing for that long awaited Maui cycling vacation? No need to panic! Our bike store has everything you need to enjoy a cycling vacation on Maui. Tubes, tires, bike helmets, pedals, gloves and bike clothing along with an extensive selection of original West Maui cycles logowear designs to remember your cycling vacation on Maui. Browse our bike logo gear online where you can purchase West Maui Cycles logo hats, t-shirts, bike water bottles and other bike gear! Stop at our Lahaina bike shop to share your latest Maui cycling adventure or get the latest Maui bike ride tips and advice about bicycle riding in West Maui. Check out our vintage bike collection during your visit. Its a mini bike museum with several interesting vintage bikes and scooters from yesteryear.